Hello friends! I’m sorry it has been so long since my last post, things have been hectic around here because of the holidays (Christmas is my busiest time for orders and this year was no different) I’ve had little time for anything but crocheting and sleeping. OK. That’s a lie. I got some very nice time in with my family- my daughter turned 3 at the end of November so I can easily say that this was the most magical Christmas of my adult life so far. I received some amazing news around the same time- The application I submitted to be a challenger in the Design Wars Challenge was accepted! I’m SO excited! I’ll be going head to head with some of my crochet idols in this challenge, I hope I can keep up! For those of you who aren’t familiar with the challenge, it was founded by Salena Baca of Baca Creations and is sponsored by Red Heart Yarns. A yarn is chosen for the challengers to work with and they each come up with a new, original design. Once the designs are completed and revealed, the public gets to vote on their favourites in a number of different categories. There is a lot of fun to be had and there are even prizes to be won! There is SO much amazing talent in this round, I hope you’ll check it all out! For more information about this elite crochet challenge, please visit http://www.designwarschallenge.com. While I’m waiting for my Design Wars yarn to arrive, I decided to get the ol’ pattern-writer primed up. What I came up with is possibly the fastest, easiest, one skein cowl you’ll ever make. I made mine with a skein of Loops & Threads Charisma and it took me less than an hour. Available for FREE on Craftsy and Ravelry for, I hope you’ll rush over and download a copy! If you make one up, let me know what you think! On AmigurumiBB’s blog! Check out these adorable Christmas ornaments! I’m SO in love with the snowmen, I NEED to find time before Christmas to make them! Free patterns! Go check them out! What are your bad crafting habits? Do you leave yarn tails all over? Do you start a project only to abandon it when you find something new and exciting to work on? I’m not going to confess all my crafting sins but one of my biggest (and most hated by my husband) is that I stick pins in the arm of the couch. 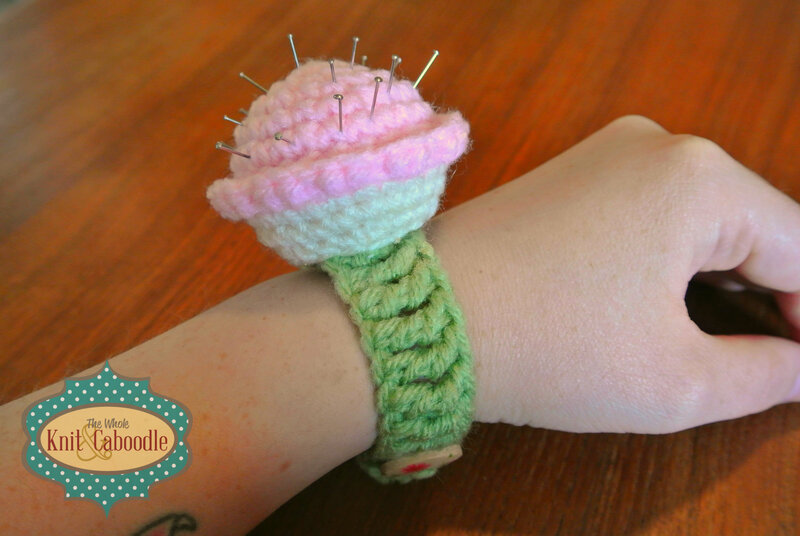 While I don’t see the cupcake bracelet catching on as a fashion accessory anytime soon, it’s perfect for keeping pins close at hand at wrist when you’re sewing or assembling a knitting/crochet project. This is a great project to use up leftover yarn and it works up very quickly. Approx. 8 yds of worsted weight yarn in your choice of colour for the “”frosting”. Approx. 4 yds of worsted weight yarn in your choice of colour for the cupcake bottom. Approx. 6 yds of worsted weight yarn in your choice of colour for the bracelet. A small amount of polyester stuffing. Gauge isn’t terribly important. Using a F5/3.75mm hook I ended up with a cupcake that is about 2 1/4″ wide and 1 1/2″ high. With bracelet colour, ch until you reach desired length. I chained 34 and got a bracelet of about 7″. Tr in 5th ch from hook and in each ch across. Finish off and weave in ends. Sew bracelet to underside of cupcake. Before attaching the button, stitch together two of the triple crochets at one end. This just reinforces the material beneath the button. What I like about the bracelet is that it is adjustable- you just put the button through the spaces between the triple crochets and make it as tight or as loose as you’d like. I made a few cupcakes for my daughter (minus the bracelet and the pins), she loves them! They’re great “desserts” for tea parties!